Update: Shortly after 2:40 p.m. ET, Amazon appeared to leap back to life, without any of the company’s media or social media accounts even acknowledging the outage. If we get any sort of explanation from the e-tailer, we’ll be sure to share it. In the last few minutes, Amazon.com has gone down without explanation. Both the website and the app only tell visitors that “An error occurred when we tried to process your request. 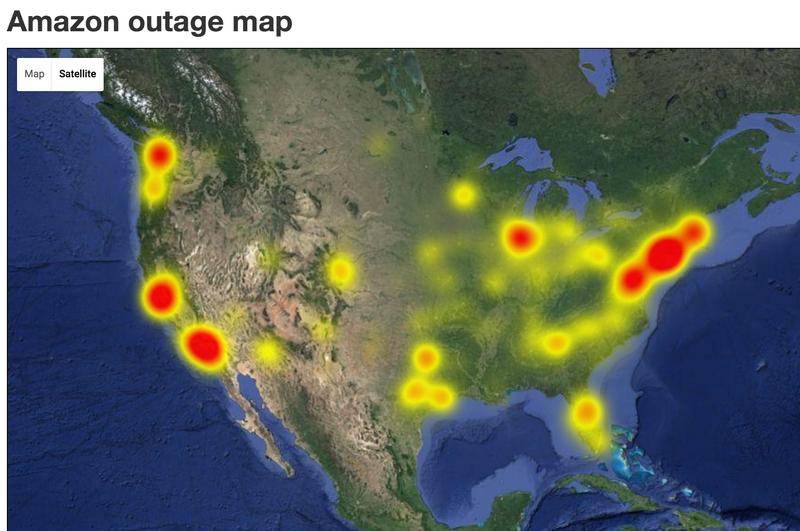 Rest assured, we’re working to resolve the problem as soon as possible.” Reports of the site being unavailable have spiked on DownDetector, which — in a matter of minutes — they received more than 10,000 complaints about the e-commerce giant being down, and where a map of Amazon outages looks like much of the continental U.S. has gone up in red and yellow flames. We’ve reached out to Amazon for comment and will update. Amazon is actually down right now. That's a first. Anyone else having trouble getting into @amazon @AmazonHelp ? ?